I want to thank Richard for inviting me and thank you for letting me participate in your class discussion. I want to share with you some general ideas today – ideas about life and about art, especially literary art. Myth = something that never happened but is always true. • If there are 22 people in this room then there are more than 10. David will pay for his lust; the child he conceived in sin will die and the other threats will also come to pass. The punishment will fit the crime: the child conceived in sin will die; the man who could not control his sexual appetites will be punished by having his wives taken in front of everyone. Note the layers of narrative here. Nathan tells David a parable. David is moved by the story. He sentences the fictional man to die. Nathan tells David that he is the man. The story is used to get the king to see himself and to judge his own acts. Just as Uriah carries his own death warrant to Joab in the form of a letter of execution, David comes to issue a death sentence on himself through Nathan’s story. When Joab opens the letter carried by Uriah he will see David’s intention; when David “opens” the story carried by Nathan he will see the Lord’s intention. 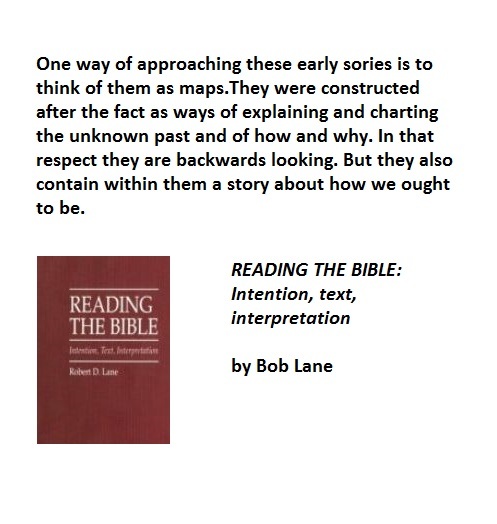 A valuable approach as reader is to consider that reading a text is a performing art. I do not mean by this that one needs to learn to be an oral interpreter, although that is a good skill to develop. I mean that in reading a text one must engage every bit of creativity, of sensitivity, of intellect and feeling that one possesses. The story is in the text, but its full experience is in the mind of the reader. The story provides form and directs responses, and the reader completes the communicative act. Think of the text as a musical score and yourself as a performing musician. The notes are there – are in the score – and you must be able to perform them on your musical instrument. You need to bring technical skill, sensitivity to nuance, and knowledge of the language of musical notation to the task. In some sense we are all and always looking for Eutopia. Eutopia means the good place and is to be distinguished from Utopia which means no place. Eutopia is a place in which human society, natural conditions, etc., are so ideally perfect that there is complete contentment. Philosophers and poets have over the years given us glimpses of what Eutopia might be like. In my Eutopia human solidarity would be seen not as a hoped for after-life but as a goal in the here and now. It is to be achieved not by further inquiry but by imagination, the imaginative ability to see strange people as fellow sufferers. Solidarity is not discovered by contemplation but created. It is created by increasing our sensitivity to the particular details of the pain and humiliation of other, unfamiliar kinds of people. We need to come to see other human beings as “one of us” and not as “them” – story can help us in this quest. Let me end with an example of a story, the truth of which, I do not know. I relate it because its truth is not important. It changed my attitude. For years I have been prejudiced against a certain group of humans. Even long ago as a college student I used to shy away from members of this group. Confronted with them I withdrew with fear and repugnance. I knew I was wrong to do so but I could not seem to get what I knew incorporated into what I do. Each of us creates a narrative in our life, writes a STORY as we walk toward the grave. Well said, Kevin! I was a student in his classes in 1989. Learned a lot from him.